At Johnson & Johnson, health is our business. For more than 130 years, we have been committed to improving the health of individuals, families and communities around the world, including the most vulnerable and underserved populations. Today, we are undertaking even greater steps to unlock the potential of innovation for everyone, everywhere, and, through a spirit of collaboration, help to solve some of the most complex global health problems—reinforcing our commitment to lead the next frontier of health. 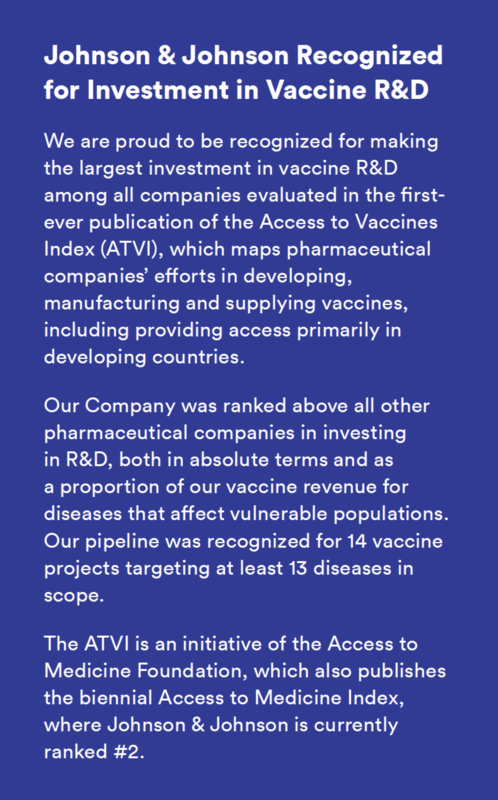 By harnessing our Company’s collective breadth, scale and legacy of scientific innovation, we strive to live up to Our Credo responsibilities and change the trajectory of health for humanity. Critical public health challenges require bold leadership and novel ways of delivering impact. To address these challenges, we created Johnson & Johnson Global Public Health (GPH). Charting a bold new, self-sustainable approach, GPH is the first fully-dedicated organization within a healthcare company focused on combining innovative R&D, novel access programs and approaches, in-country operations, advocacy, and the power of multi-sectoral partnerships. GPH seeks to ensure that treatments and technologies are available, affordable and accessible for the world's most underserved populations. Our global public health strategy is focused on tackling some of the world’s most pressing health challenges, including HIV, tuberculosis, neglected tropical diseases, and the growing burden of non-communicable diseases. GPH is committed to achieving transformational health outcomes for communities, placing an end-to-end focus on accelerating the pace of innovation needed – from discovery to delivery – to make TB and HIV history, eliminate intestinal worms, address mental health, and drive progress against other public health challenges, with our deep expertise in health spanning three distinct but interconnected business segments. We recognize that these efforts are a massive undertaking; we have set big goals. Despite tremendous progress in medical science and technology during the last decades, significant gaps remain in health outcomes for many people around the globe. Emerging new global challenges, such as antimicrobial resistance, will require collective effort and close partnership between societal actors to bring forward solutions. As a global citizen and a healthcare innovator, we are committed to making a positive impact on these challenges, and we are optimistic about what the future holds for human health. When people are healthy, they can go to school, take care of their families, and contribute productively to their economies; in short, entire communities and nations thrive.